That did not stop Obama from swapping them for a disgraced Army solider, Bowe Bergdahl, who was captured by the Taliban after deserting his post in Afghanistan. The secret exchange violated the law and written White House rules. The nonpartisan investigative arm of Congress, the Government Accountability Office (GAO), determined that the president broke a “clear and unambiguous” law when he traded the high-level terrorists for Bergdahl, who went AWOL in Afghanistan in 2009. Bergdahl left his post and was held captive by the Taliban-aligned Haqqani network in Afghanistan from June 2009 until May 2014. The circumstances surrounding Bergdahl’s disappearance and subsequent capture have become the subject intense controversy. He was released on May 31, 2014 in exchange for the five terrorists, Mullah Muhammad Fazel Mazlum, Mullah Noorullah Noori, Mullah Abdul Haq Wasiq, Mullah Khairullah Khairkhwa and Maulavi Muhammad Nabi Omari. The United States is less safe because of these actions.” Judicial Watch investigated the controversial Bergdahl trade and sued the Department of Defense (DOD) for records involving then Defense Secretary Chuck Hagel’s determination that the terrorists were “no longer a threat to U.S. national security.” Judicial Watch also litigated to obtain the bilateral Memorandum of Understanding between the U.S. and Qatar relating to the terrorist release. Besides gang members and mobs of young angry men, the Central American caravan making its way into the United States also consists of Africans, Bangladeshis, Sri Lankans and Indians. Judicial Watch is covering the crisis from the Guatemalan-Honduran border this week and observed that the popular mainstream media narrative of desperate migrants—many of them women and children—seeking a better life is hardly accurate. Guatemalan intelligence officials confirmed that the caravan that originated in the northern Honduran city of San Pedro Sula includes a multitude of Special Interest Aliens (SIA) from the countries listed above as well as other criminal elements and gang members. There are also large groups of men, some with criminal histories, aggressively demanding that the U.S. take them in. 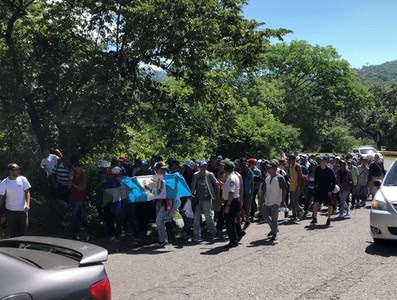 During a visit to the Guatemalan town of Chiquimula, about 35 miles from the Honduran border, Judicial Watch encountered a rowdy group of about 600 men, ages 17 to about 40, marching north on a narrow two-lane highway. Among them was a 40-year-old Honduran man who previously lived in the United States for decades and got deported. His English was quite good, and he said his kids and girlfriend live in the U.S. Another man in his 30s contradicted media reports that caravan participants are fleeing violence and fear for their life. “We’re not scared,” he said waving his index finger as others around him nodded in agreement. “We’re going to the United States to get jobs.” Others chanted “vamos para allá Trump!” (We’re coming Trump) as they clenched their fists in the air. “We need money and food,” said a 29-year-old man who made the trek with his 21-year-old brother. All of the migrants interviewed by Judicial Watch repeated the same rehearsed line when asked who organized the caravan, insisting it was a spontaneous event even though there were clearly organizers shouting instructions in Spanish and putting select persons in front of cameras for interviews. Honduran President Juan Orlando Hernández, a conservative, said in a local newspaper report that leftist interests seeking to destabilize the country are manipulating migrants. Women and children are being used without regard to the risks to their lives, Hernández said. “The irregular mobilization was organized for political reasons to negatively affect the governance and image of Honduras and to destabilize the peace of neighboring countries,” the president said, adding that many have returned to the country after realizing they’ve been fooled. Guatemala is overwhelmed with the sudden onslaught and immigration officials confirmed 1,700 migrants have been returned to Honduras on buses. The first wave of migrants totaled about 4,000, according to Guatemalan government sources, followed by a second, less organized group of about 2,000. The impoverished Central American nation needs help, including logistical, communications and civil affairs support to stop the human caravans. “There are only so many resources we can dedicate to this,” said Guatemalan Secretary of Strategic Intelligence Mario Duarte. Guatemalans are getting robbed and crimes are being committed by the people in the caravans, Duarte said. JW Director of Investigations and Research Chris Farrell appeared on “Lou Dobbs Tonight” on the Fox Business Network to discuss President Trump’s rally in North Dakota and FBI official Peter Strzok’s testimony on Capitol Hill. Guatemala has long been known as a major smuggling corridor for foreigners from African and Asian countries making their way into the U.S. Last year Guatemala’s largest paper, Prensa Libra, published an in-depth piece on the inner workings of an international human smuggling network that moves migrants from Afghanistan, Pakistan, India, Nepal and Bangladesh to the U.S. Individuals are sent to Dubai in the United Arab Emirates then flown to Brazil before heading to Colombia. Once in South America, the migrants are transported to Panama before moving on to Costa Rica then a central point on Guatemala. One Spanish news report refers to Guatemala as a human smuggling paradise because it’s so easy to get fake passports. A few years ago, the head of Guatemala’s passport division got arrested for selling fake passports to a group of Colombians, according to a government announcement. All this makes ISIS terrorists operating in Guatemala incredibly alarming. President Jimmy Morales confirmed it during a recent security conference attended by Vice President Mike Pence and Secretary of State Mike Pompeo as well as the presidents of Honduras and El Salvador and other Latin American dignitaries. Morales said that his administration has captured “close to 100 persons completely involved with terrorists, with ISIS and we have not only detained them within our territory, but they have been deported to their country of origin.” Several of the terrorists were Syrians caught with fake documents, according to Guatemala’s head of intelligence. At the same event, President Morales also revealed that Guatemalan authorities captured more than 1,000 gangbangers, including members of the MS-13. Many more probably make it into the U.S. via the Mexican border and a lot of them get released inside the country. In fact, Border Patrol agents in Texas have been ordered to release illegal immigrants caught entering through Mexico because detentions facilities have no bed space, according to a news report. Earlier this year Judicial Watch exposed a secret program—started by Obama and continued by Trump— that quietly relocates illegal immigrants to different parts of the country on commercial flights. Years earlier Judicial Watch uncovered a similar DHS initiative that transported illegal immigrants from the Mexican border to Phoenix and released them without proper processing. August 10, 2018- JW President Tom Fitton appeared on “the Chris Plante Show” on WMAL to discuss FBI payments to Christopher Steele and Judicial Watch’s lawsuit for communications between Steele, Bruce Ohr, and Fusion GPS. JW President Tom Fitton appeared on “Fox and Friends” on the Fox News Channel to discuss President Trump’s request for a DOJ probe into whether the FBI infiltrated his campaign. Check out JWTV on our Youtube Page!